NYU Stern’s MS in Risk Management (MSRM) Program hosted the third Risk Roundtable Series on January 28. 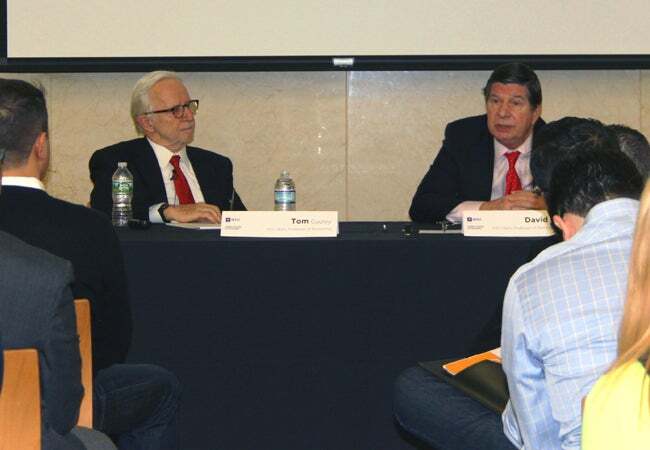 Approximately 65 attendees including Stern alumni and industry professionals gathered to hear from Stern Professor Tom Cooley and NYU Professor of Politics and Economics David Denoon, director of NYU’s Center on US-China Relations. The evening’s discussion focused on growth in the US since the financial crisis, economic conditions in the Eurozone and the economic slowdown in China, all of which are a source of interest for the global economy in 2016. The speakers discussed several items that may be contributing to a global economic slowdown, such as changing demographics, labor markets and domestic and foreign policy.